Sometimes less is more. And in the case of Cecil Murphey’s Knowing God, Knowing Myself: An Invitation to Daily Discovery (Regal, 2010), fewer words mean abundant wisdom. Murphey, who has served authors such as Dr. Ben Carson (Gifted Hands) and Don Piper (90 Minutes in Heaven) as ghost- and collaborative writer, uses his writing skill and passion for spiritual exploration to present this poignant, personal offering. 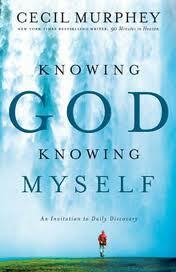 His dual commitment to know God and know himself underlies this sensitive collection of meditations. Each moves toward an aphorism (pithy statement of truth) gleaned from the wisdom of years as a Christ-follower. The author’s distinctive voice shines through each brief (two to four pages) chapter. He uses only the most essential word-gems, polished until they gleam with truth. And his transparency about his spiritual shortcomings made it easier for me to contemplate my own. Murphey’s aphorisms both pricked my spirit and pulled me closer to God. Statements such as “I am seldom angry about what I think I’m angry about” and “Many things grab our attention; fewer things grab our heart” left me nodding my head in agreement as tears rolled down my cheeks. I thank God—and Cecil Murphey—for this insightful book. Have you read this book or another by Cecil Murphey? Or has Cec, who ministers to many in the writing community, touched your life in some way? Please share your comments. Clearly you do. Thanks for many kind words. When I started this blog, I made a commitment not to post negative reviews. But I already had a commitment to speak the truth. I trust you–and other readers–know I meant what I wrote. Thanks, Cec.